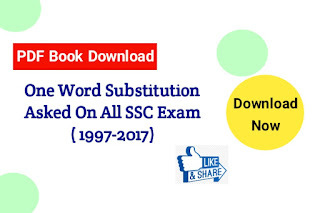 Looking for One Word Substitution PDF Book Asked on SSC Exam 1997 to 2017? If your answer is yes, then here is the best place for you. One Word Substitution is very important for All SSC Candidates. So we suggest that you must practice daily One Word Substitution. Objective English is very important for All SSC, and PSC Clerkship Exam. We know, SSC candidates are looking for One Word Substitution PDF book on the internet. Today we are sharing One-word Substitution asked on All SSC Exam from 1997 to 2017. You can easily download all this pdf file here, also free of cost. Hope, this post is very useful to you.